Old Collegians are full-time undergraduate students at either the University of Notre Dame or Holy Cross College. They are free to study any major that interests them in addition to their required studies of philosophy and theology. They are also free to participate in many of the intellectual and extracurricular opportunities that are available at Notre Dame and Holy Cross. The schedule at Old College emphasizes prayer and the common life. The prayer schedule includes daily Mass, the Liturgy of the Hours, and periods of common Eucharistic Adoration. Collegians meet regularly with the formation staff, as well as with a spiritual director who helps them grow as Christian disciples. Weekly formation conferences teach them about the priesthood, religious vows and the charism and history of the Congregation of Holy Cross. Old Collegians also engage in regular ministry placements, where they have the opportunity to develop their ministerial skills and put their formation into practice. Formation at Old College occurs in group conferences and one-on-one meetings, and also through the day-to-day interactions they have with the formation staff and with their brothers in community. These interactions, both formal and informal, help a young man grow in maturity and cultivate his leadership skills. They also help him develop the generosity of spirit that any servant of the Church must possess. In addition, the Old Collegians make a retreat together in the fall and spring semester to deepen their discernment and advance their spiritual growth as men of God. Men who apply to Old College should be mature, responsible and active in the Church. They should have a solid foundation of prayer and service, as well as a strong academic record. More than anything else, they should have a strong desire to know where God is calling them, and a willingness to learn more about that call so that they may follow it. For a man who has that sense of a call to priesthood and religious life, living in a seminary is the best way to figure out if that is indeed the vocation to which God is calling him. View posts on our vocations blog from our Old Collegians on their life in the seminary. Take a virtual tour of Old College. Meet our current Old Collegians. Learn how Old College fits in the wider program of priestly and religious formation in Holy Cross, culminating with Final Vows and Ordination. Read and reflect on Constitution 6 on "Formation and Transformation" that describes our program of priestly and religious formation in Holy Cross. Attend a Come and See Weekend as a high school junior or senior to experience life in Old College first hand. Contact us in the Office of Vocations. The best way to discern whether Old College might be a good fit for you is to meet the men in person and experience our life firsthand. 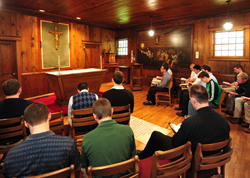 The Office of Vocations offers many differnet ways for you to come and visit.